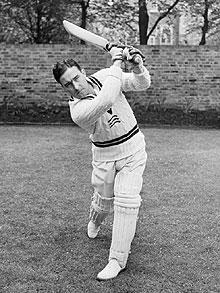 Denis Compton was an english cricketer who played Test cricket for England from 1937 to 1957. He was born on 23 May, 1918 at Henden (Middlesex) and died on 23 April, 1997 at Windsor (Berkshire). 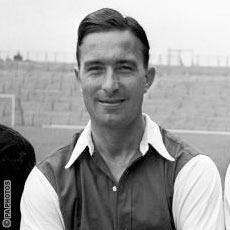 Denis Campton also played as a footballer for Arsenal. In cricket, he was a tall right-hand batsman who also bowls left-arm chinamen bowling. Denis Compton started playing cricket for MCC (Marylebone Cricket Club) in 1936 and scored 1004 runs in 20 matches in his debut season. His Test debut came against New Zealand in 1938 at Kennington Oval Ground where he scored 65 in his only inning of the match. He also took two wicket in the New Zealand's second innings. He next played in the series against Australia. He made century in the first match of the series. In the second test at Lord's he played a valuable innings of 76 not out. When West Indies toured England in 1939, he again scored a century in the first test at Lord's. In the English season that year he made 2468 runs in 31 matches including eight centuries. After World War in the 1947 season he made 3816 runs in 30 matches with a very good batting average of 90.85 including 18 centuries. South Africa toured England in same year for a five match series. He made four centuries in five matches. He scored 755 runs in that series. In his next series against Australia led by Don Bradman, he strucks two centuries - 184 in first test and 145* in third test. He scored 562 runs in the series. Comptaon's highest Test score came against Pakistan in 1954 at Trent Bridge (Nottingham) where he scored 278 runs. In 1956, he played his last test against Australia and scored 94 in that match. He continued playing first-class matches till 1964. Compton was also capable of bowling few overs. In test he was not used much as a bowler, but in first-class career he bowled a little more. He has 622 first-class wickets in his kitty. In 1947 season, he took 73 wickets in 30 matches averaging 28.12. He improved this figure in 1952, when he had 77 wickets averaging 28.58 in that season. Nineteen times, Compton had took 5 wickets in an inning and three times he was able to took 10 wickets in a match.